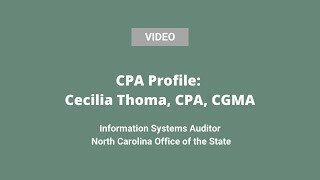 Cecilia Thoma, CPA, CGMA, says “In every accounting position, you always face decisions that are not just financial decisions.” Cecilia believes her management accounting sensibilities and CGMA designation helps her succeed daily as the Information Systems Auditor at the North Carolina Office of the State. Growing up in Guadalajara, Mexico, Cecilia found herself working in accounting at the age of 16. Despite working in the field through the remainder of high school, it wasn’t until she moved to the United States — by way of London — that she finished her bachelor’s degree in accounting from North Carolina State University with a concentration in information technology. Upon completion of her undergraduate degree, Cecilia knew she needed to get her CPA license if she wanted to stand out and be successful. She studied hard — her advice for CPA Exam candidates is “study every single moment you have” — and that dedication paid off. She passed all four sections on the first try. And with her aspirations to work for global companies, Cecilia also acquired her CGMA. “The CGMA designation is not instead of, but in addition to the CPA,” she says. In addition to being recognized globally, “another important qualification of the designation is that you are an accountant who takes into consideration data that is not just financial. And sometimes, other factors outside of financial information are important in decision making.” Currently, Cecilia is focused on supporting the Office of the State Auditors goal to ensure the N.C. taxpayers’ money is being used properly. Speaking of mentorship, Cecilia also recommends looking for a mentor to help choose the types of classes that will prepare you for your career path. She also recommends getting internships to build your network and leverage your local and national organizations to help you (a.k.a. your friends at your state CPA society and the AICPA). She has personal experience successfully finding a mentor through her state society, NCACPA, when she was moving into the information systems field. An experienced professional in her desired field helped her determine the best way in and she’s now looking back victoriously as an Information Systems Auditor. Want to let the world know you see the bigger picture through the CGMA designation? Learn more about management accounting and then find your fit in the profession. My work day starts by checking my emails and calendar to organize priorities. Then the majority of my day goes into preparing audit documentation (unless assigned to a CAAT routine) that includes all kinds of work papers; narratives, analytics, issue sheets, tests, defining samples, etc. While preparing the audit work papers, it is normal to come across questions about the procedures, estimates, or any processes that are part of the audit or requiring further documentation/evidence from the auditee. As these situations arise, I make a phone call or send emails requesting interviews with the auditee or documentation required. I enjoy using my lunch time for a 30 minutes of meditation to help me to stay focused on what is important and to achieve balance in my life. The duration of these meetings vary depending on segment — anywhere from half an hour to two hours. I drive to the auditee offices to discuss the procedure in question, request any further documentation, inform them of any concerns identified, or provide the auditee with an update of any issues. As part of the Information Systems team, we extract data required for audits from various agencies and university systems. Sometimes the data needs to be cleaned and formatted for its use; we do this for other divisions as required. At other times we need to develop a CAAT routine (Computer Assisted Audit Technique), used to test specific areas of the audit; these are usually more time consuming and once developed are used recurrently. Much like the auditee meetings, the duration of the data retrievals range from an hour to a full day depending on the request. Status update on issues related to the audit in course. I regularly attend events that focus on my personal development. Sometimes is a networking event or a training/CPE event, but tonight I'm participating at the Toastmasters International club to better my public speaking skills.